I was surprised – there’s no salt, vanilla, baking powder, which are all standard ingredients in any baked goods. She assured me that it wasn’t a mistake and that it was really that simple. 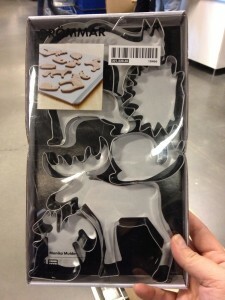 I was at IKEA recently and I found these adorable cookie cutters. The hedgehog is what convinced me to buy it, but I also love the snail and squirrel. I made the simple dough, and let it chill for 8 hours. 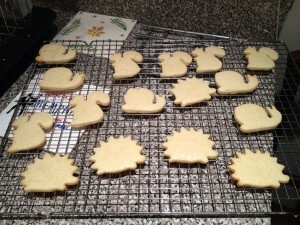 I rolled them out on the thick side, about 3/8”, so they took 15 minutes in the oven, till lightly golden on the edges. I went with a simple lemon glaze (lemon juice & powdered sugar), to mirror the lemon in the cookie. I thought they were quite good, but I thought Dina’s was better. I think a thick frosting would have paired better with the cookie. Next time I’ll make my salted caramel frosting to decorate it. --What Robin said upon receiving the cookies. Thank you, he is really enjoying them.